Lawmakers in at least six states, including California and New York, have introduced bills in recent weeks that would forbid internet providers to block or slow down sites or online services. Washington state Gov. Jay Inslee also has weighed in. WASHINGTON — A new front is opening in the battle to restore net-neutrality rules: state legislatures. Lawmakers in at least six states, including California and New York, have introduced bills in recent weeks that would forbid internet providers to block or slow down sites or online services. Legislators in several other states, including North Carolina and Illinois, are weighing similar action. Washington state Gov. Jay Inslee has also weighed in. They are responding to the Federal Communications Commission’s vote last month to end regulations that barred internet service providers from creating slow and fast lanes for different sites and services. The new policy will go into effect in the coming weeks. By passing their own law, the state lawmakers say, they would ensure that consumers would find the content of the choice, maintain a diversity of voices online and protect businesses from having to pay fees to reach users. And they might even have an effect beyond their states. California’s strict auto-emissions standards, for example, have been followed by a dozen other states, giving California major sway over the auto industry. “There tends to be a follow-on effect, particularly when something happens in a big state like California,” said Harold Feld, a senior vice president at a nonprofit consumer group, Public Knowledge, that supports net-neutrality efforts by the states. Bills have also been introduced in Massachusetts, Nebraska, Rhode Island and Washington. The issue has also attracted some support in governor’s mansions. In Washington state, for example, Inslee reiterated his support for a state law in a speech this week. “When Washington, D.C., takes away that protection, we must protect net neutrality for our people, for our businesses and for the virtues of free speech,” said Inslee, a Democrat. But the bills are still in the early stages and could face roadblocks. Many similar efforts by states to restore broadband privacy rules that Congress repealed last year have stalled or been scrapped. And any such state law could be challenged in courts. The Federal Communications Commission’s new order, which rolled back rules passed in 2015, blocks state and city governments from creating their own net neutrality laws. The commission said different state laws were too difficult for an internet service provider, like Verizon or Charter, to follow because the internet does not recognize state borders and transfers traffic between states. “The internet is the ultimate form of interstate commerce, which is clearly only within the authority of the FCC,” said Bret Swanson, a fellow at the American Enterprise Institute who specializes in telecommunications policy. But the state lawmakers argue that they have an obligation to protect consumers with net neutrality rules and that local governments can approve or deny requests by telecommunications providers to operate in their states. They also argue that it is unclear if the Federal Communications Commission can declare a blanket pre-emption of states, something they say Congress would have to do. In 2016, a federal court ruled against the commission’s effort to pre-empt state laws related to municipal broadband networks. “People should not be intimidated by the FCC simply saying it has pre-emptive authority, and we need to dig into the sources of that claim, which are a lot weaker than the FCC makes it out to be,” said Washington state Rep. Drew Hansen, a Democrat who has introduced one of two net neutrality bills in Washington in recent weeks. The Federal Communications Commission declined to comment but pointed to the section of its order that pre-empts states from creating their own net-neutrality rules. Supporters of net neutrality are attacking the agency’s repeal of the 2015 rules in other ways as well. On Tuesday, Sen. Chuck Schumer of New York, the Democratic leader, announced that he had enough support to force a vote on a congressional resolution to bring back the rules. He gained an important Republican supporter, Sen. Susan Collins of Maine, who said she would vote in favor of it. Such a measure is a longshot in the House, however, and would also need President Donald Trump’s signature. “Net neutrality will be a major issue in the 2018 campaigns, and we are going to let everyone know where we stand and where they stand,” Schumer said at a news conference, warning Republicans to vote in favor of the Democratic-led resolution. In addition, lawsuits against the commission are expected shortly after the policy becomes official. Last week, a lobbying group for big technology companies including Facebook, Google and Netflix announced that it planned to join the lawsuits, giving the opposition substantial new resources. More than a dozen state attorneys general have also announced plans to sue the commission. But state lawmakers say they cannot wait around to see what happens with those efforts. 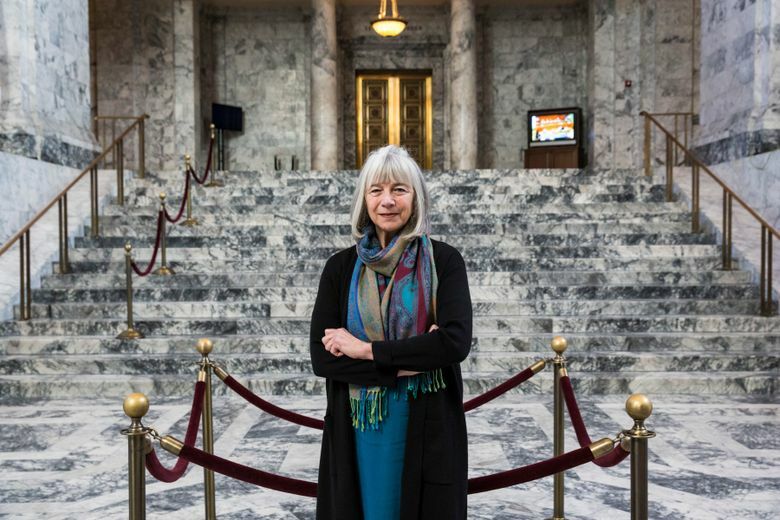 State Rep. Norma Smith, a Republican who introduced the other bill in Washington, said net neutrality was an important safeguard for small businesses that might not be able to pay internet service companies for fast speeds. Even though Republicans in Washington, D.C., supported the repeal, she said many Republicans in her state supported her bill. State Sen. Kevin de León, a leader in the California Senate, said net neutrality would be a major issue in his campaign against Sen. Dianne Feinstein in the Democratic primary this year. He said a net neutrality bill he had introduced, one of two in California, had the backing of tech companies and many consumers in his state. Feinstein has criticized the Federal Communications Commission’s vote. “If the Trump administration won’t protect consumers, the state of California will,” de León said. In New York, Assemblywoman Patricia Fahy, a Democrat, said a few internet service providers already had too much power over the marketplace and should not be given the ability to charge websites more for faster delivery to users. This month, she introduced a bill that would hold back state telecom projects from broadband providers that blocked, throttled or gave priority to sites that paid for faster access. Legislators in Rhode Island and North Carolina have introduced or are considering similar bills that are more focused on government contracts than telecom law, they say.